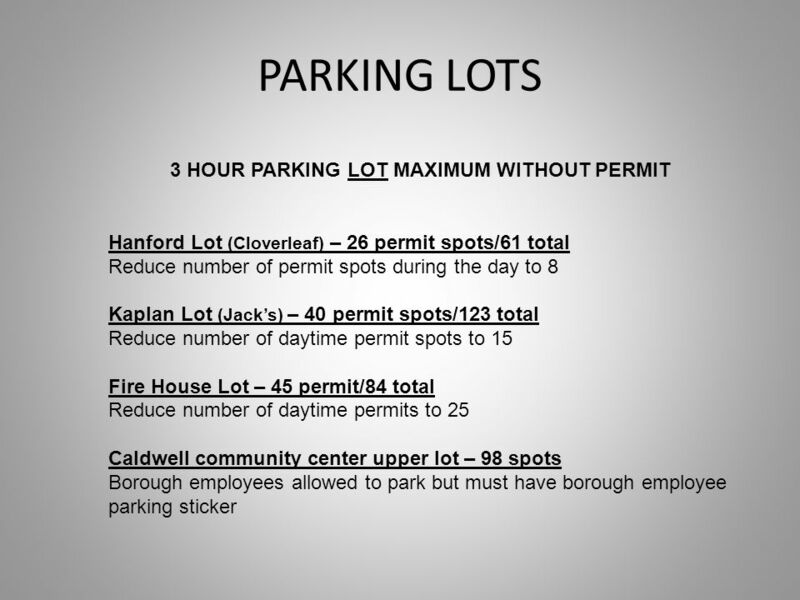 Caldwell Public Safety Parking Initiatives MARCH 6, 2012. 2 WHY MAKE THE CHANGES? 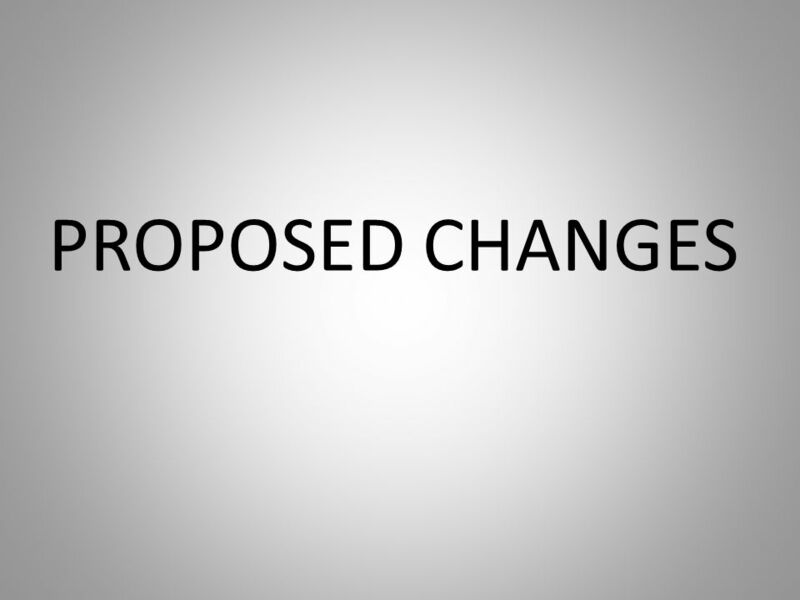 THERE ARE DESCREPENCIES, MISSING CONTENT AND OUTDATED WORDING IN THE CURRENT ORDINANCE. METER ZONES DONT HAVE METERS. OUT OF TOWN COMMERCIAL VEHICLES TAKING UP PERMIT SPOTS. COMMUTERS PARKING ALL DAY IN SPOTS. NON RESIDENTS PARKING IN PERMIT SPOTS. MERCHANT COMPLAINTS ABOUT LACK OF PARKING. APARTMENT TENANTS NEED EXTRA PARKING SPACES. POLICE UNABLE TO ENFORCE DUE TO CONFUSING LAWS. 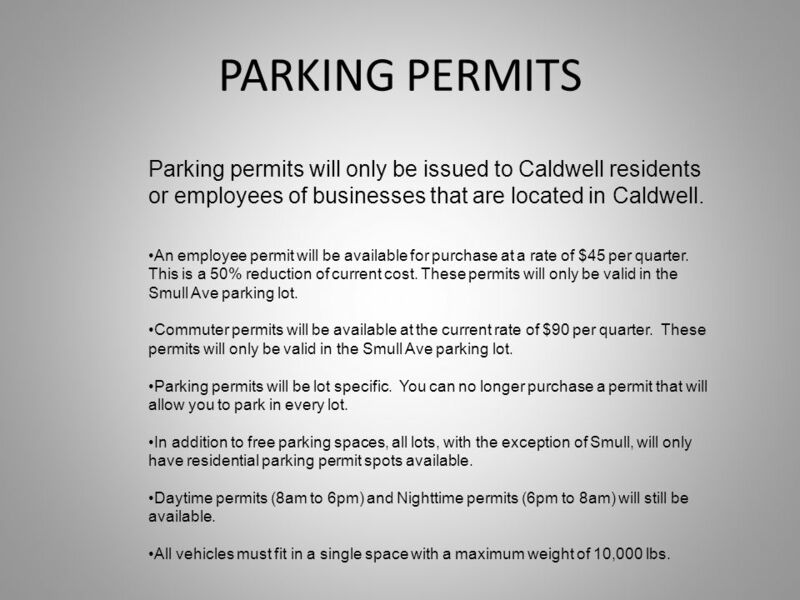 8 PARKING PERMITS Parking permits will only be issued to Caldwell residents or employees of businesses that are located in Caldwell. An employee permit will be available for purchase at a rate of $45 per quarter. This is a 50% reduction of current cost. These permits will only be valid in the Smull Ave parking lot. 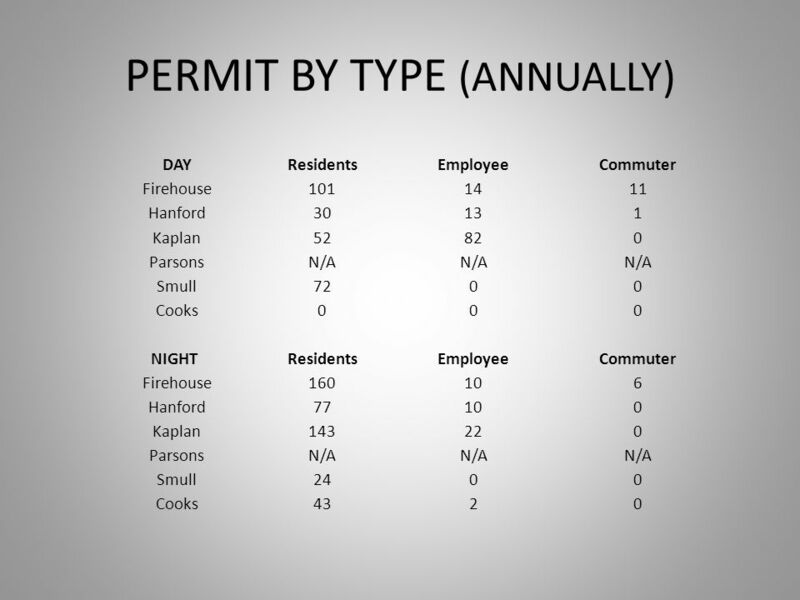 Commuter permits will be available at the current rate of $90 per quarter. These permits will only be valid in the Smull Ave parking lot. Parking permits will be lot specific. 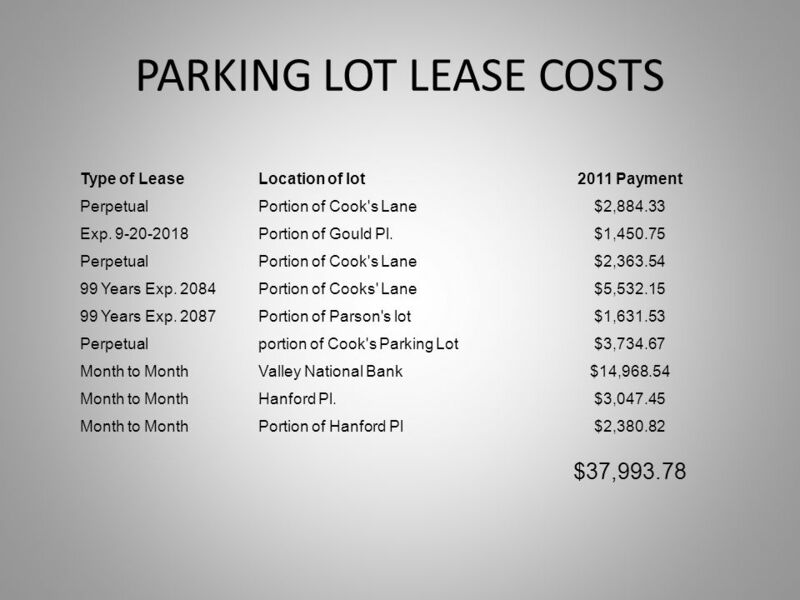 You can no longer purchase a permit that will allow you to park in every lot. 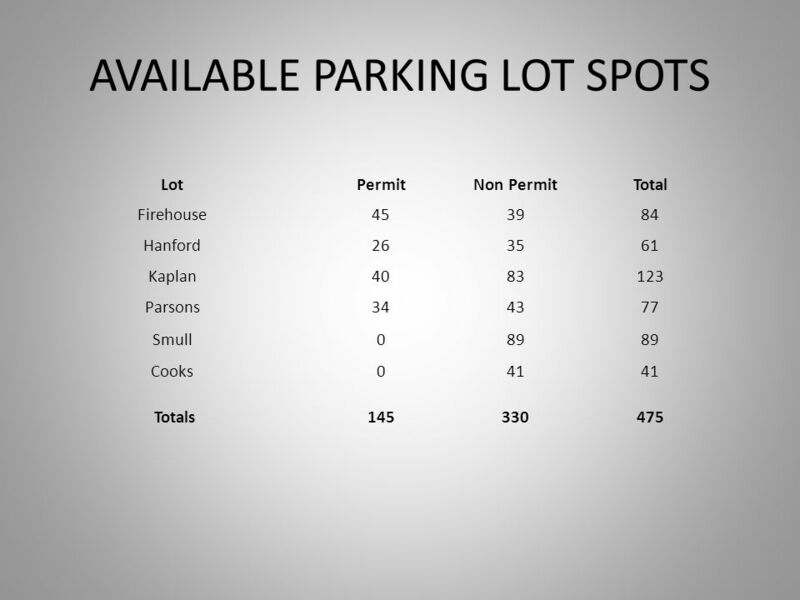 In addition to free parking spaces, all lots, with the exception of Smull, will only have residential parking permit spots available. Daytime permits (8am to 6pm) and Nighttime permits (6pm to 8am) will still be available. All vehicles must fit in a single space with a maximum weight of 10,000 lbs. 11 ON STREET OVERNIGHT PARKING Designated streets would be portions of: Elm RoadAcademy RoadArlington Ave Westover AveParkway East/WestProspect Street Washburn PlaceEspy Road Permits will only be issued for residents that live on the street or for apartment tenants that are adjacent to these streets. 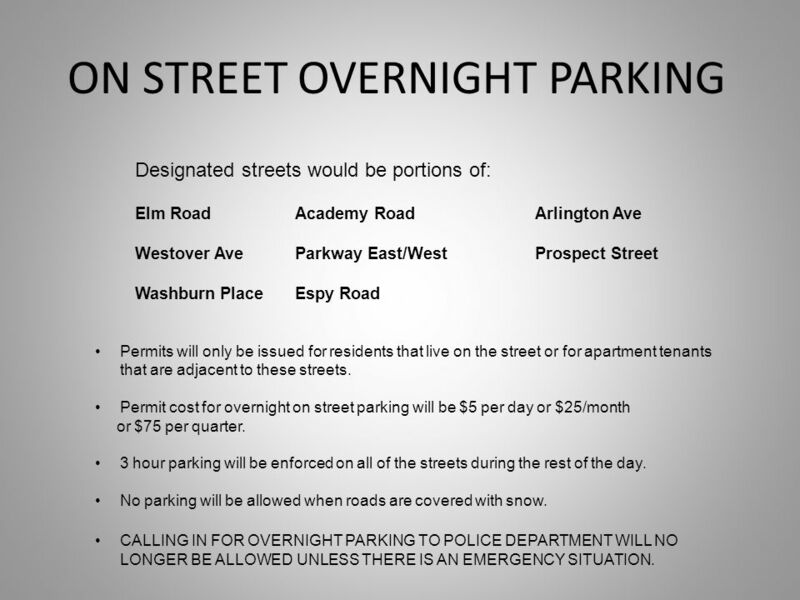 Permit cost for overnight on street parking will be $5 per day or $25/month or $75 per quarter. 3 hour parking will be enforced on all of the streets during the rest of the day. No parking will be allowed when roads are covered with snow. 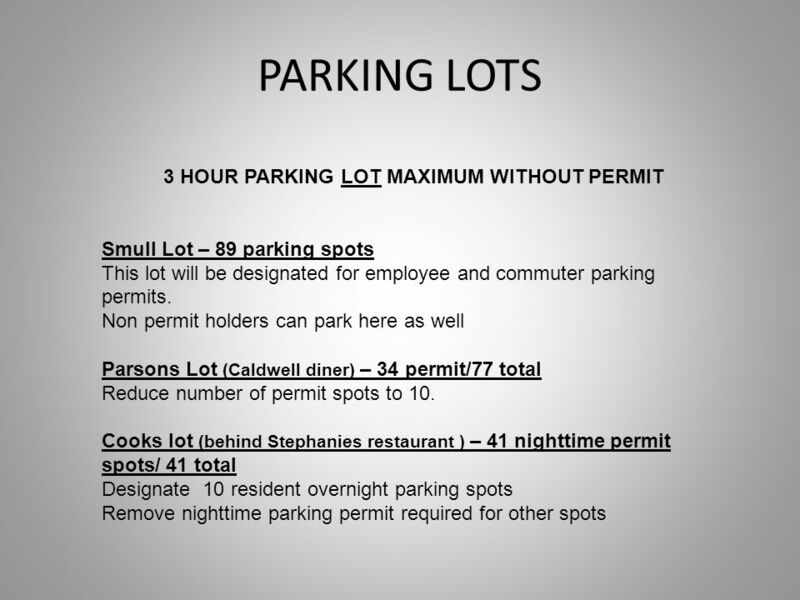 CALLING IN FOR OVERNIGHT PARKING TO POLICE DEPARTMENT WILL NO LONGER BE ALLOWED UNLESS THERE IS AN EMERGENCY SITUATION. 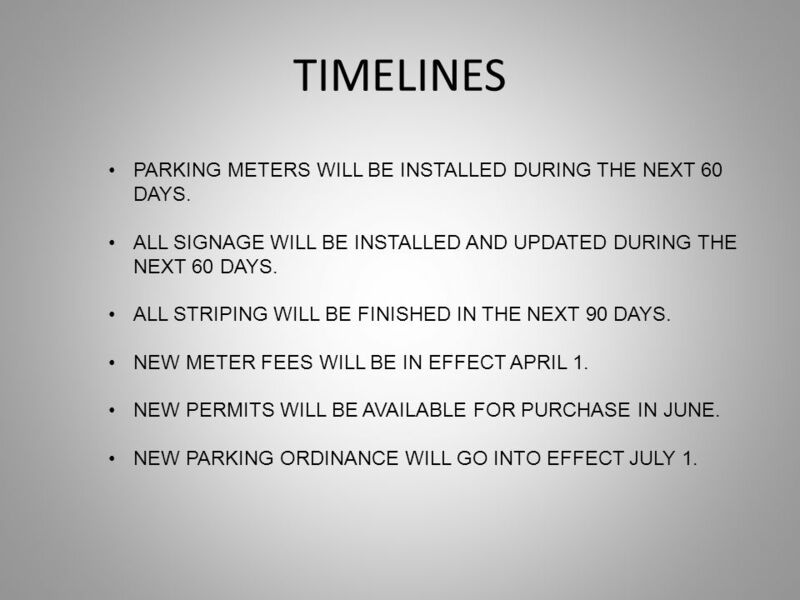 13 TIMELINES PARKING METERS WILL BE INSTALLED DURING THE NEXT 60 DAYS. ALL SIGNAGE WILL BE INSTALLED AND UPDATED DURING THE NEXT 60 DAYS. ALL STRIPING WILL BE FINISHED IN THE NEXT 90 DAYS. 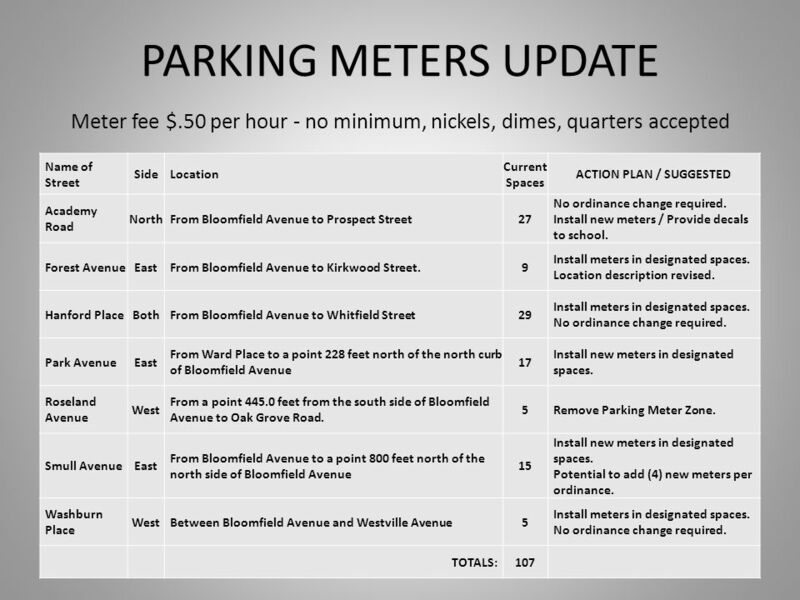 NEW METER FEES WILL BE IN EFFECT APRIL 1. 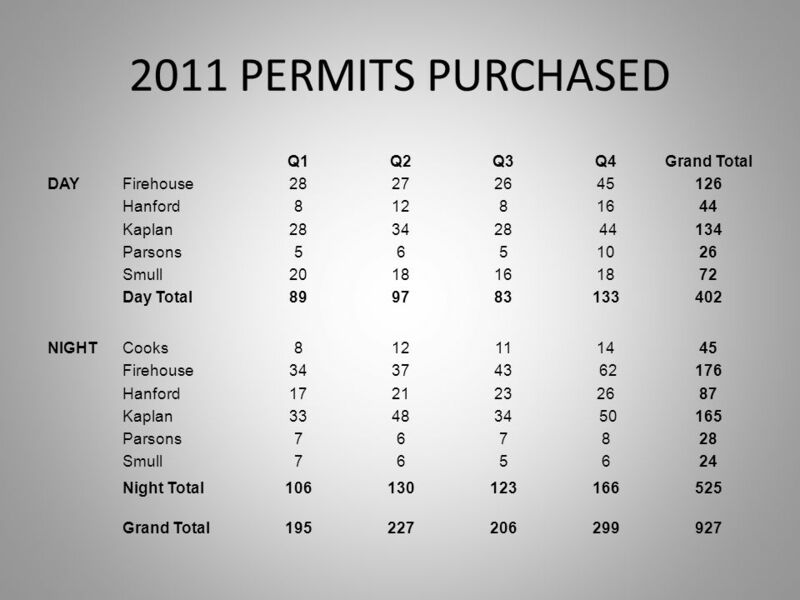 NEW PERMITS WILL BE AVAILABLE FOR PURCHASE IN JUNE. 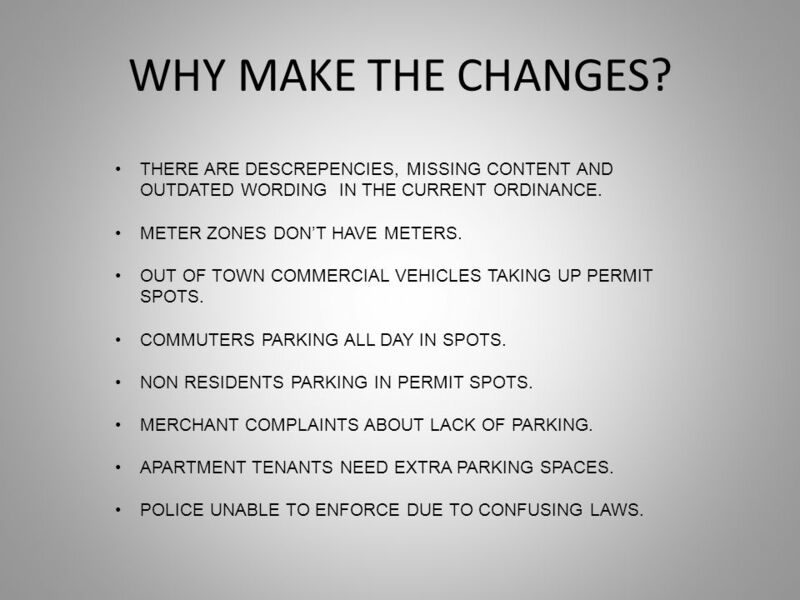 NEW PARKING ORDINANCE WILL GO INTO EFFECT JULY 1. 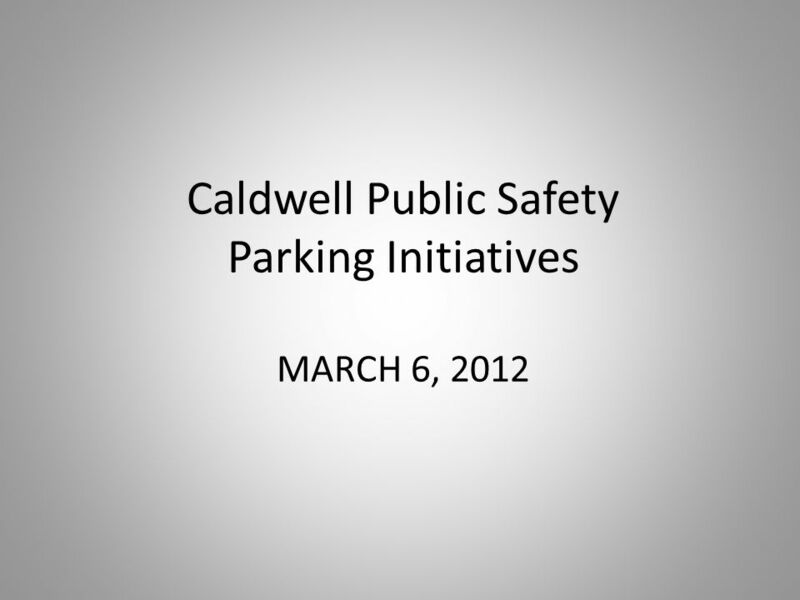 Download ppt "Caldwell Public Safety Parking Initiatives MARCH 6, 2012." What are maintenance districts? Created by Ordinances through City Council Have specific boundaries Provide funds for specific types of maintenancebe. Behavioral Health DATA BOOK A quarterly reference to community mental health and substance abuse services Fiscal Year 2011 Quarter 4 October 10, 2011.